This diagram dates from 1924, and is to be found in an article published by Robert Robinson (J. Soc. Chem. Ind., 1924, 43, 1297, a journal difficult to get hold of nowadays). Here, Robinson was trying to explain why the nitroso group is o/p-directing in aromatic electrophilic substitution. Whilst the notation is remarkably modern, some aspects do need explaining. Robinson shows the nitrogen lone pair (arrow 1) as a line, and not as we now do, a double dot. Similarly, he shows arrow 3 ending at a line. We now do not show this in the starting structure, but reveal it in the final result, as above on the right, and again shown as a double dot. Similarly, he shows a + charge on the nitrogen at the start, whereas we now show it as the outcome of the process. If Robinson intends to create a +ve charge, then he really should balance that by showing the creation of a negative charge in the p-position of the ring. He does not balance his charges! As was the custom at the time, the benzene ring itself is not represented in the Kekule mode (which of course should have been well known in 1924) but as what looks to us now as cyclohexane. 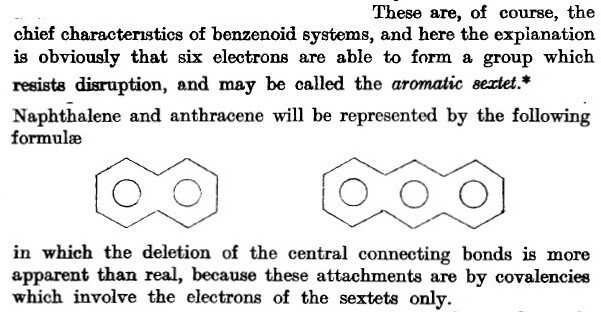 It must have been the case in 1924 (and for several decades after) that cyclohexane itself was not regarded as an interesting system, and hence there must have been little confusion about drawing benzene as (modern) cyclohexane. The implied semantic of showing such a ring was that it represented benzene. But this way of drawing it leads to really difficult issues. Thus Robinson’s arrow 2 departs from what looks to us like a single bond, in which case no bond would be left. Robinson of course means implicitly that arrow 2 reduces the bond order by one, and if we start with a double bond from a Kekule structure, that the bond is reduced to 1, not zero, as is shown in the modern notation above. Likewise, the destination of arrow 2 in Robinson’s notation clearly creates a double bond. Which again is an issue, since he is not showing the double bonds. The trouble really arises because Robinson does not illustrate the outcome of his process. Finally, whereas arrow 1 starts at a line representing a lone pair, that line is disconnected from the N. However, the destination of arrow 3 appears to create a bond, not a lone pair. Now that we have clarified Robinson’s meaning, what else can we say about Robinson’s structure. It is important to realise that in 1924, the 3D characteristics of electrons (their wavefunction) were not known. Looking at the modern version of the diagram, chemists realise that when a double line is drawn, the two are not the same. One line represents a σ-bond, the other a π-bond. We recognise that the two have different spatial characteristics. Hückel it was who showed that in planar aromatics, the two sets are in fact orthogonal, and do not mix. At which point we need to sort out what the three arrows in Robinson’s diagram represent. Arrows 2 and 3 we recognise as π-arrows. But what of arrow 1? I decided to do a search of the Cambridge data base for nitrosobenzenes, finding 22 sets of coordinates. In all except one, the two atoms of the nitroso group were co-planar with the six of the benzene ring. We now know of course that this places the nitrogen lone pair firmly in the plane of the eight atoms, and hence of a σ-type. Strictly therefore, it is orthogonal to the π-arrows and cannot be mixed with them. The solution of course is to first rotate the nitroso group by 90° to bring the nitrogen lone pair into conjugation with the π-system, whereupon Robinson’s arrows now “work”. On a more minor point, we recognise that the nitrogen lone pair occupies a trigonal position, and so we draw the C-NO group as bent, rather than linear as Robinson did. If the co-planarity of the nitroso and benzene rings is retained, then the only way to draw the arrows is in the opposite direction to Robinson, resulting in the creation of a -ve charge on the oxygen and a +ve charge on the p-carbon. This of course is the resonance we now show for the nitro group, and implies m-direction, not o/p. Which raises the fascinating question. Why, if the structure of nitrosobenzenes appears to be planar and not rotated, is the nitroso group nevertheless observed to be an o/p director? The answer of course must be in looking at the properties of the transition state, and not the starting material itself. But in 1924, the concept of a transition state itself was not yet recognised. So this little blast-from-the-past example still gives us lots to think about! This entry was posted on Friday, July 20th, 2012 at 10:55 am and is filed under Curly arrows. You can follow any responses to this entry through the RSS 2.0 feed. You can leave a response, or trackback from your own site. Thanks for this nice historical perspective on mechanistic chemistry. Thinking about how the o/p directing effect; wouldn’t it be possible to account for this from the starting material if the first arrow was drawn from the N=O double bond, leaving a positive charge on the oxygen? Or perhaps it is unlikely to have a positively charged oxygen next to a nitrogen? Yes, that is an alternative source of electrons, but as you say leaving a +ve charge on the oxygen. I suspect even in 1924 this was probably considered unlikely. A very interesting example, Henry! As you point out, it’s not the starting material structure that matters but the transition state (or the cation which should approximate the TS quite well). When forced to interact with an empty p-orbital of a carbocation, even the N=O pi-bond should behave as a donor. Another possibility is that nitroso group would behave as a chameleon: act as a pi-acceptor in the ground state but rotate 90 degrees (and rehybridize) to become an n-donor in the transition state. It would be interesting to check this with a computation! and that the correct relationship between the two structures is as valence bond isomers (another example might be the two bond shift isomers of cyclo-octatetraene). And something that we have access to, but was not even a twinkle in Robinson’s eye is high level solutions of Schroedinger’s equation, which addresses the point Igor makes above. This will give an answer as to what sort of species the structure on the right actually is. It could be a stable valence bond isomer of nitrosobenzene, or it could be a transition state interconverting two bent forms. I will comment on the results of this shortly. I am going to continue the discussion above in a separate post, because the limitations of WordPress do not allow me to embed objects in the text here. I am adding here another interesting diagram, this time dating from 1925 in another article published by Armit and Robinson. It reinforces the fact that prior to Hückel in 1929, there was insufficient understanding of the difference between π and σ-electrons. 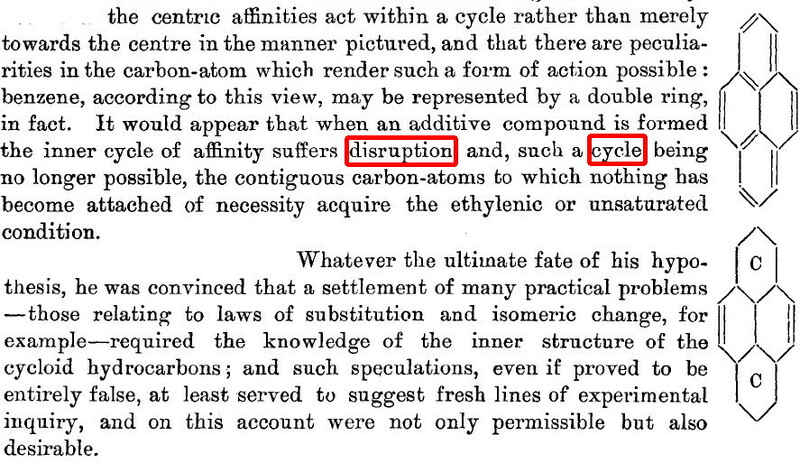 The use of the word disruption reminds of Henry Armstrong’s use of the same word, in more or less the same context, in 1890, 35 years earlier (for the context, replace Armstrong’s use of the words cycle of affinity, by Robinson’s use of the word electrons). It seems quite probable that Robinson and Armstrong met, since they were both alive at this period. Anyway, my point here is that Robinson, entranced by the aromatic sextet he has (re? )discovered, was determined that one cannot have too much of a good thing, and creates two sextets in naphthalene. The comments about borrowing two (what we now know as σ) electrons from the central C-C bond is (in 1925) no difficulty. I suppose perhaps we should instead give Robinson credit for inventing the homo-aromatic bond? At any rate, posterity has judged Armstrong’s 1990 representations of the polycyclic aromatics as having survived extremely well, whereas Robinson’s has not. There is an earlier Robinson paper (W. O. Kermack, R. Robinson, J. Chem. Soc. Trans. 1922, 121, 427–440) showing the use of curly arrows to represent what we would now call resonance in hexatriene (Fig (V) on page 433). The use of additional arrows to represent the formation of + and – charges is a feature of that paper too, and there are other deparutres from current practice, e.g. the use of two rather than three curly arrows. The authors make no comment about the use of the curved arrows, but the intent to use them to show how the electron pairs can move seems clear from the discussion. I came across the reference in a very interesting paper by Kunizia and Klein (Angewandte Chemie International Edition, 2015, 54, 5518-5522) that uses calculations involving “intrinsic bond orbitals” to justify the use of curly arrow mechanisms. Thanks Mike for tracking this one down. For reference, its doi:10.1039/CT9222100427. I include the diagram below. I think it fair, as you note, that it departs quite substantially from modern notation. In his 1924 effort, Robinson is clearly using the arrows there to try to explain a reaction outcome, and so it probably constitutes the first use of such arrows to try to explain a specific mechanism (even if he was wrong!). I was also struck how Robinson refers to to the Lewis-Langmuir theory rather than the sole Lewis attribution we tend to favour nowadays. Lewis considered Langmuir less than favourably, feeling the latter had borrowed his ideas without attribution. It is also true that unlike Langmuir, Lewis never won the Nobel prize for his work, and I think the modern feeling is that he was indeed hard done by.